When somebody is talking about a city trip to Eastern Europe, we probably think primarily about cities like Prague or Budapest. But Warsaw? In fact, I never heard somebody of my friends talking about the attractions of the Polish capital. But why? I wanted to find that out and so the flights and the hotel were booked quiet soon. I want to reveal that I had 4 wonderful and exciting, but also incredibly hot days in a city that has affected me like a drug. And I confess addicted! So I now want to introduce you a metropolis that has magnificent buildings from the period of socialism, ultra-modern shopping malls and a sandy beach in the city – just everything to retain impressive moments forever. 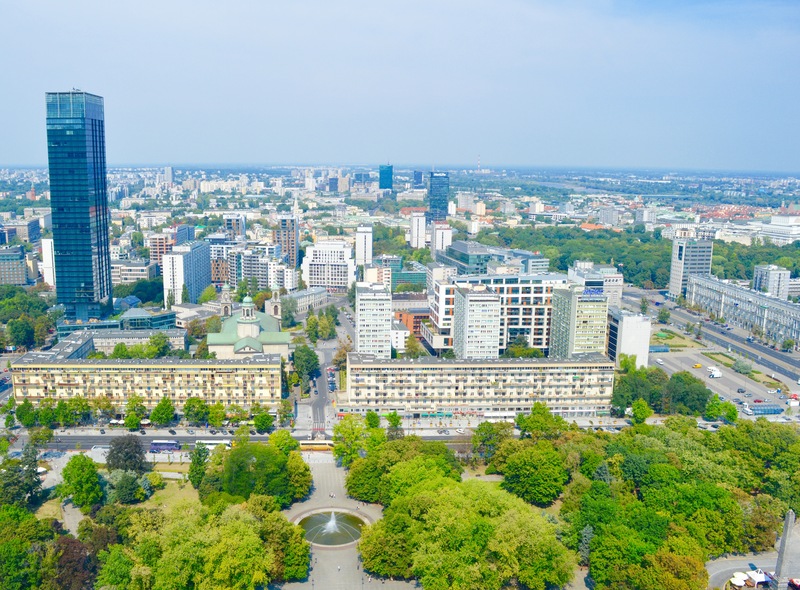 Visit the observation deck of the Palace of Culture and Science, which is the highest building in Poland – the size of Warsaw is visible only from above! 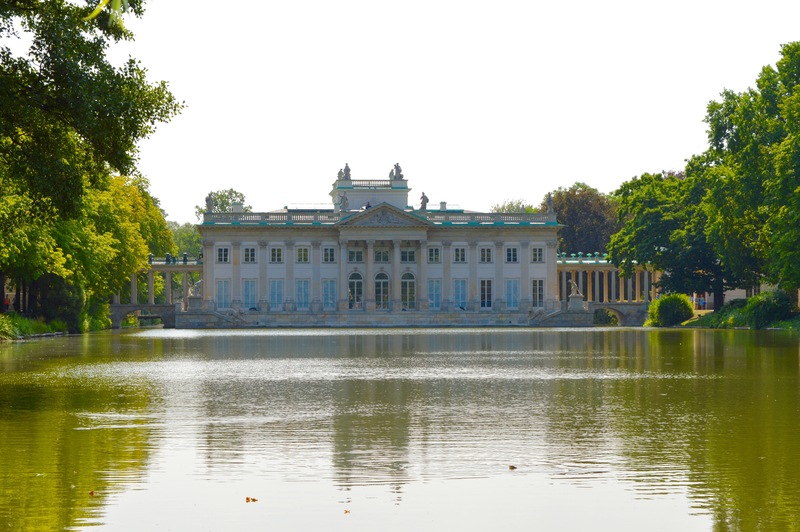 Walk through the Lazienki-Park – relaxation pure! 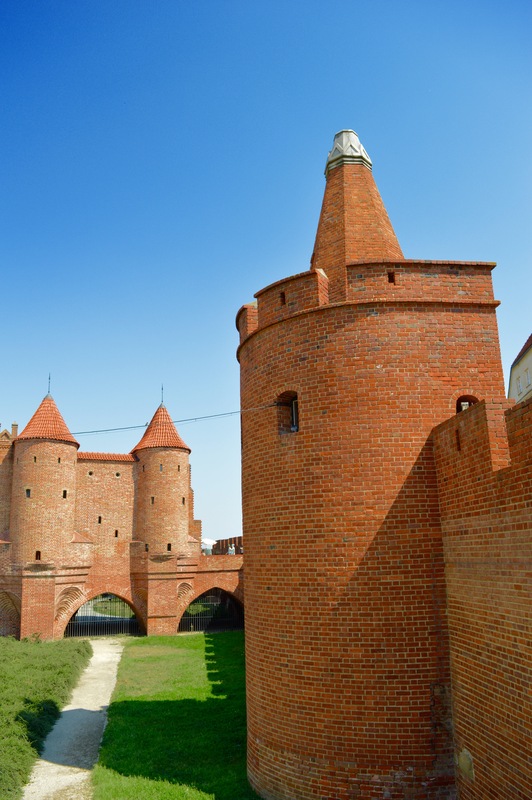 Go for a walk in the beautiful old town – history first hand! Dig your feet in the sand of the Vistula banks -in the summer- and enjoy a tasty cocktail – simply wonderful! Stroll through the winding streets of the „Centrum“ after sunset and stop off at one of the cozy restaurants and Bars – the perfect ending of the day! The city trip began at Munich Airoprt, Terminal 2. 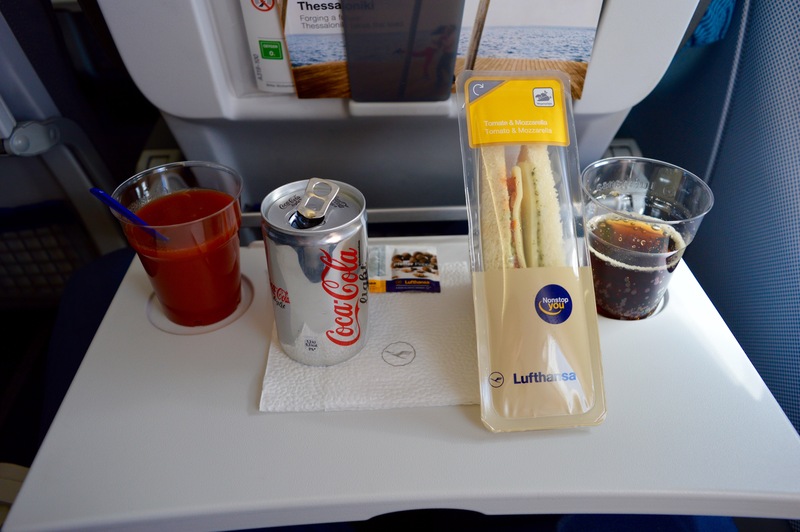 The 1.5-hour flight to Warsaw was operated by Lufthansa in the Airbus A319, the return flight in the Embraer 195 by Lufthansa Citcline. 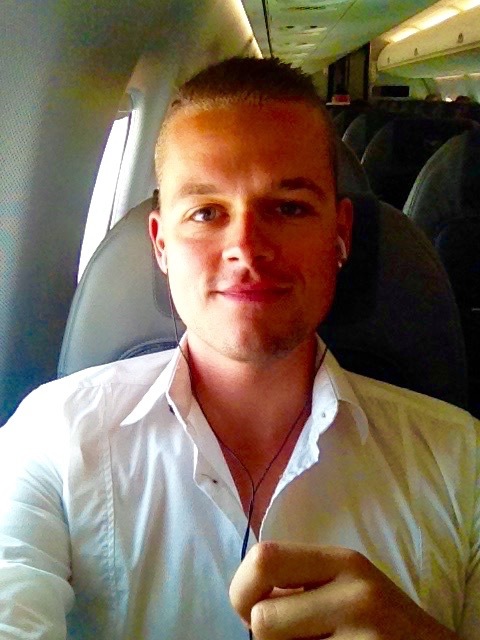 Funny coincidence: I was sitting in exact the same Airbus on the return flight from Athens in March 🙂 . 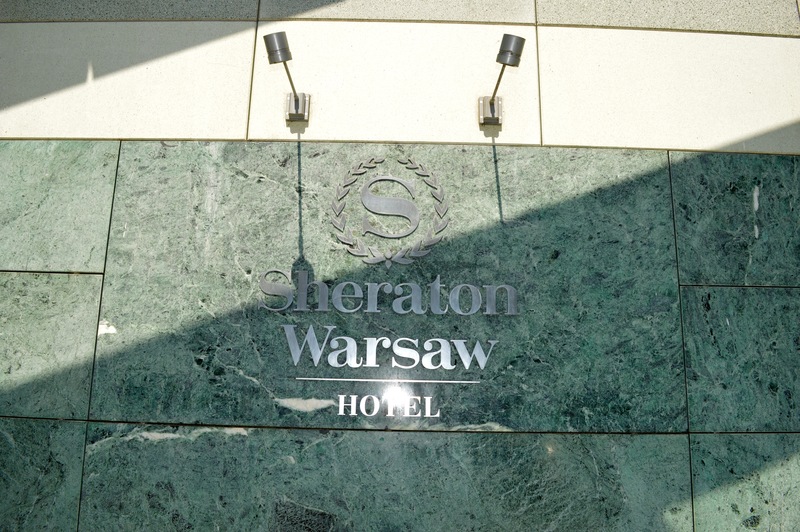 For my stay I chose the Sheraton Warsaw hotel close to the center. An excellent choice, as it turned out. More informations about the hotel, click here. Not far from my hotel, The Palm is reached after a five minutes walk. From here the road „Nowy Swiat“ begins, which is part of the Warsaw Royal Route. 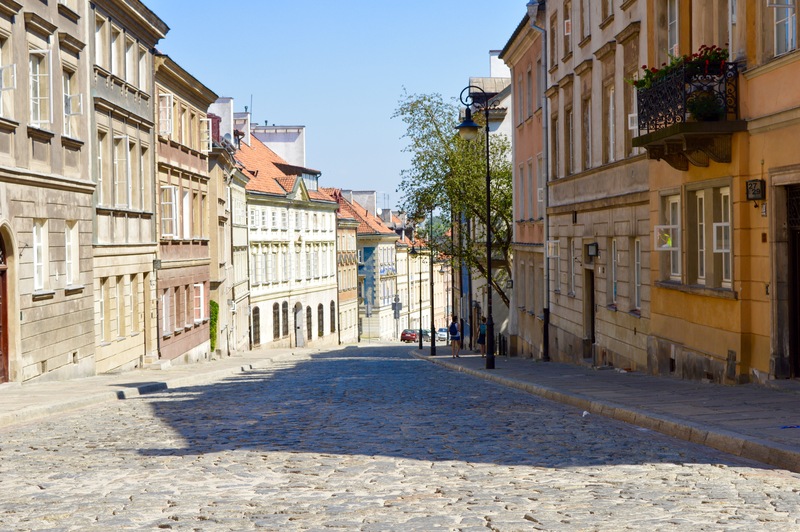 With a length of more than four kilometers, it is one of the longest representation streets in the world and leads from Lazienki Park (see report below) to the Wawel Royal Castle. 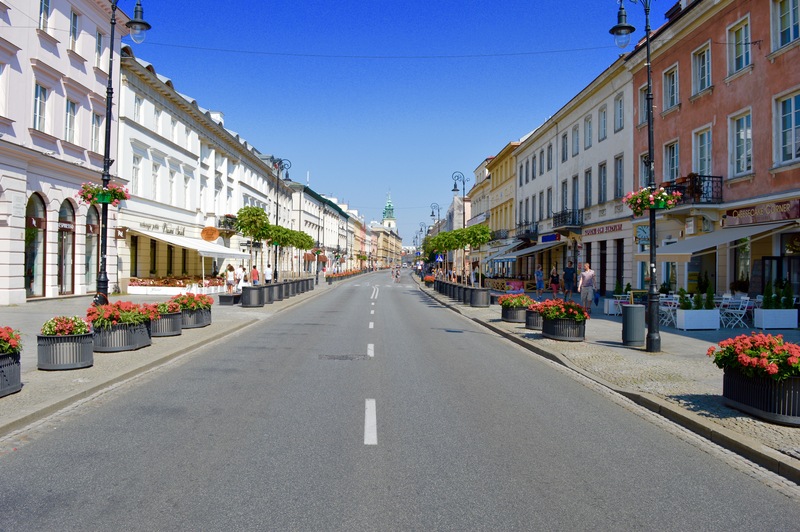 The „Nowy Swiat“ is a beautifully landscaped shopping street, where you can find various shops, cozy bars and good restaurants. Especially in the evenings, it´s worth to stroll around here, when the restaurants are filled, music is coming out of the bars and the Warsaw nightlife begins. 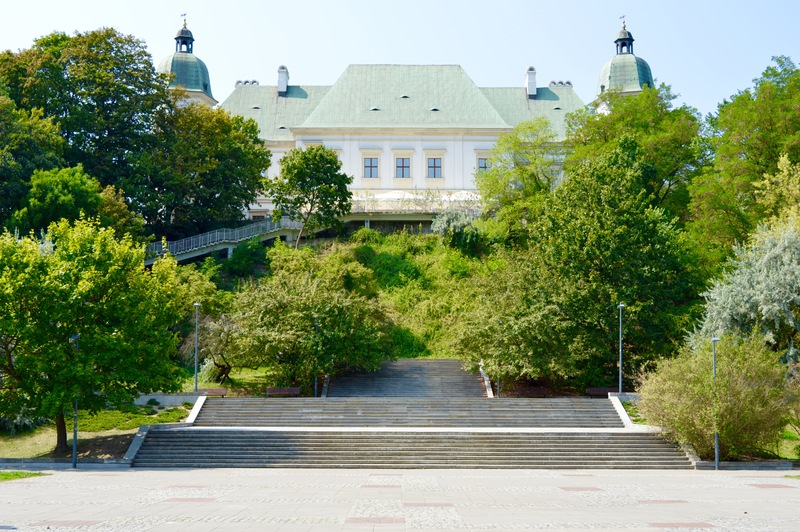 Strolling the Royal Route further to the north, you pass the presidential palace. 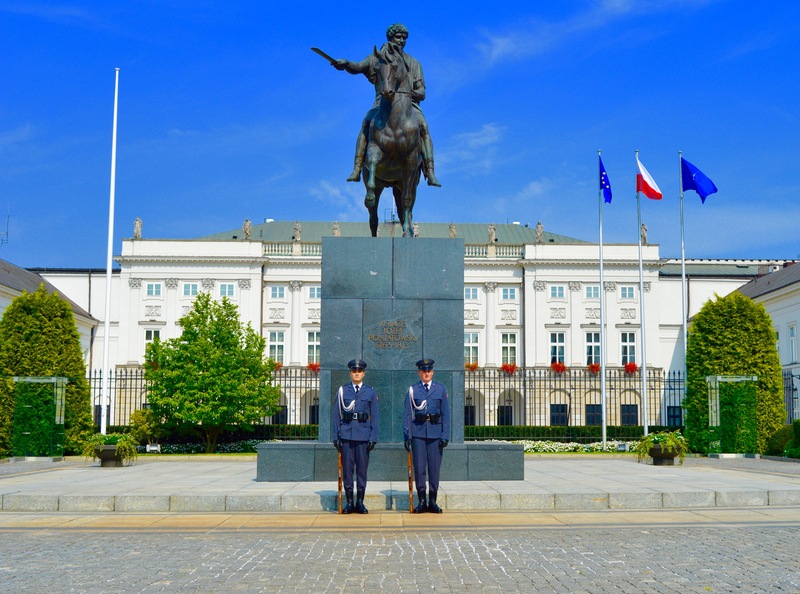 Guarded by two soldiers, this palace is still the headquarter of the Polish Prime Minister. 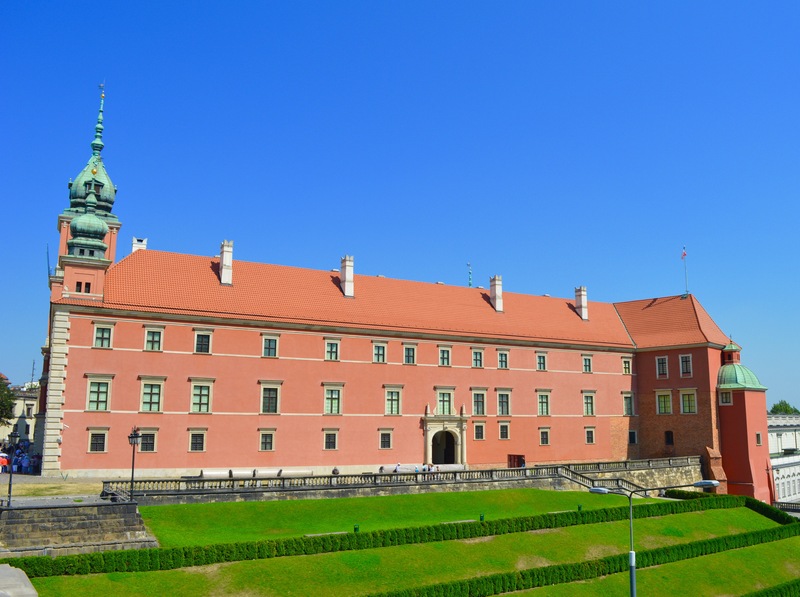 Further north, the Nowy Swiat turns into the“Krakowskie Przedmiescie“. Shortly before the famous Hotel Bristol, during my visit there was a small exhibition on the atrocities of World War II. 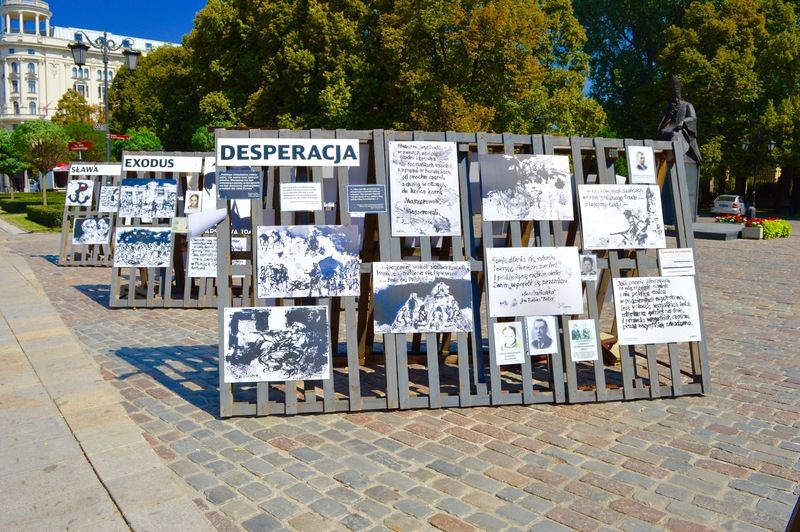 The frightening history of Warsaw was explained by original photos and documents. The more remarkable it is, how beautiful the city was rebuilt in the style of the pre-war period and now it´s spreading an incredibly cozy atmosphere. 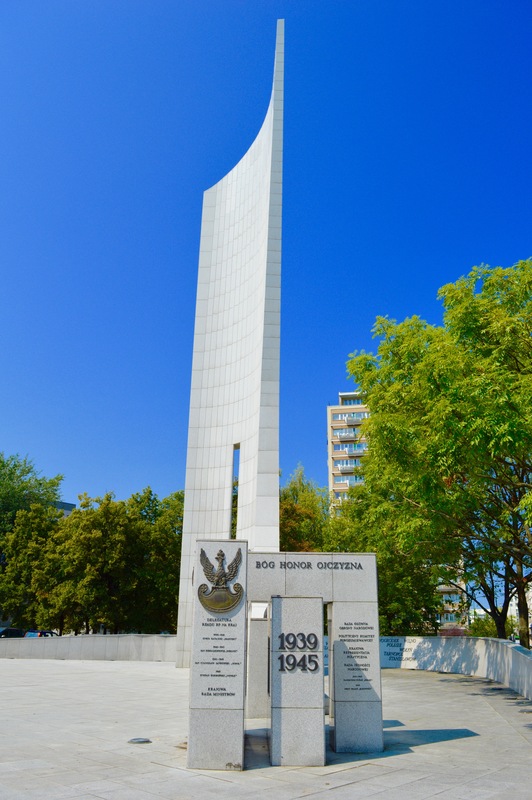 The victims of the war is commemorated with several monuments throughout the city. 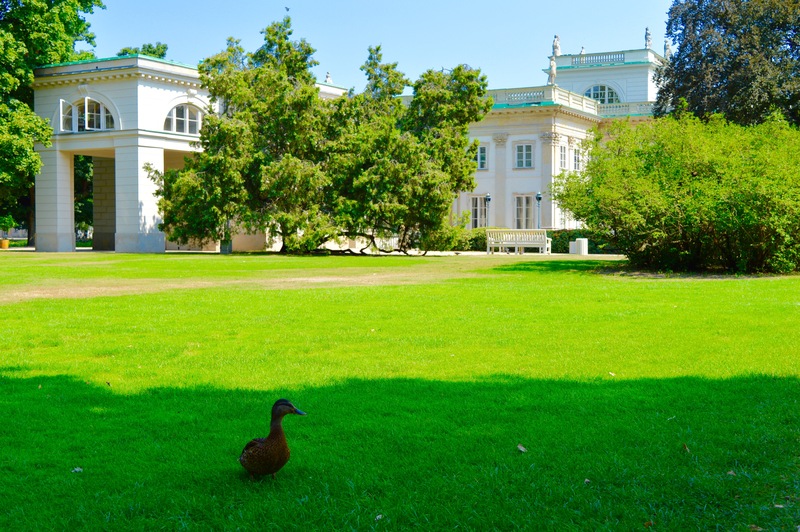 Just like here, in the embassy district near Lazienki Park. The Royal Castle represents the northern end of the Royal Way. The variety of restaurants, shops and small street vendors invites you to linger for a while. 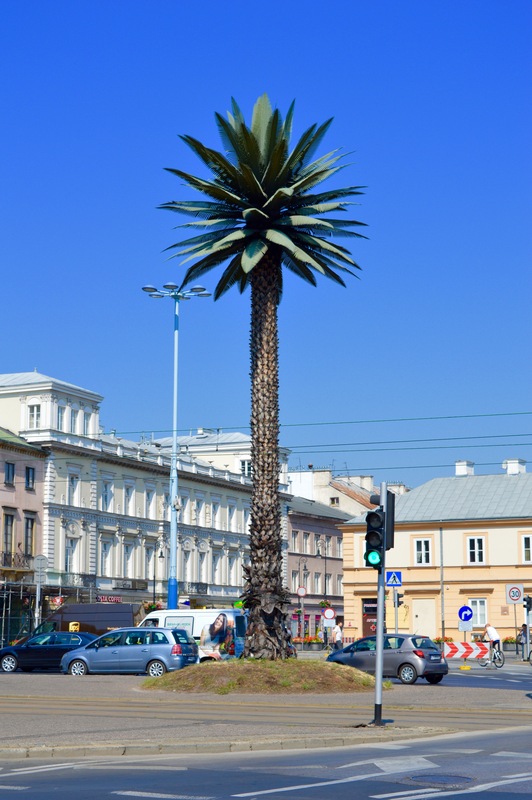 Here the beauty of Warsaw is obvious everywhere! Advisably the castle (which was also destroyed during the war) and the complete historic center was named as a UNESCO World Heritage Site. Just a few steps behind the Royal Castle you can find the also reconstructed parts of the old city wall. It is very impressive and definitely worth a visit! Only a stone’s throw away from the old town the Vistula flows through the city towards the Baltic Sea. 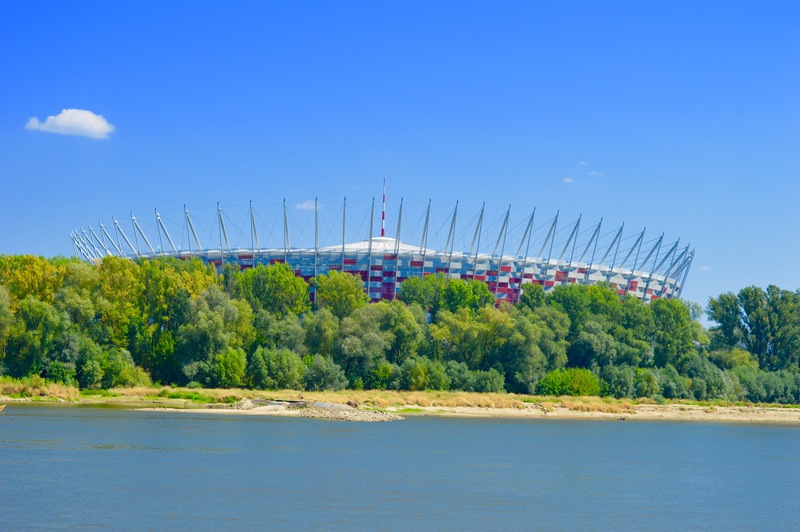 At its eastern riverside, the National Stadium enthrones in Poland’s national colors red and white. 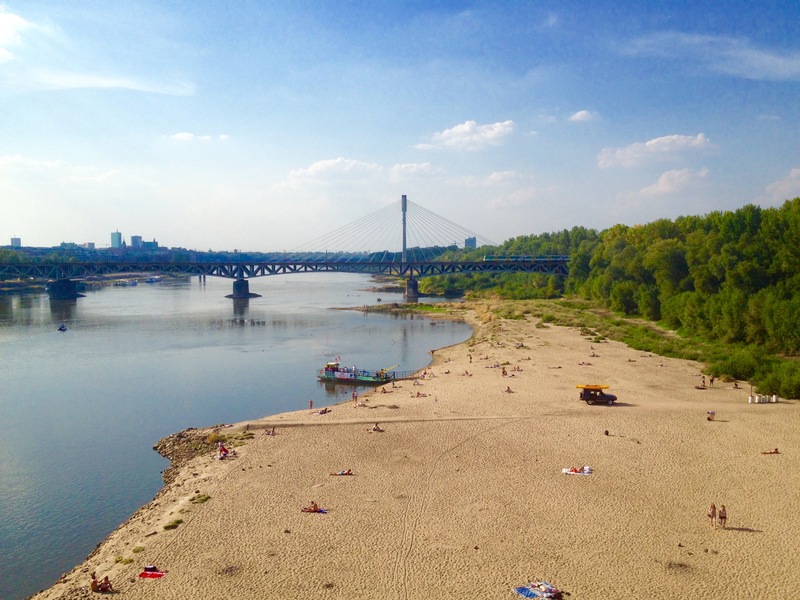 Right at the National Stadium, the Vistula sand banks invite you to linger. Clean sandbanks and some food- and cocktail stalls lets you swich off from the bustle of the city. 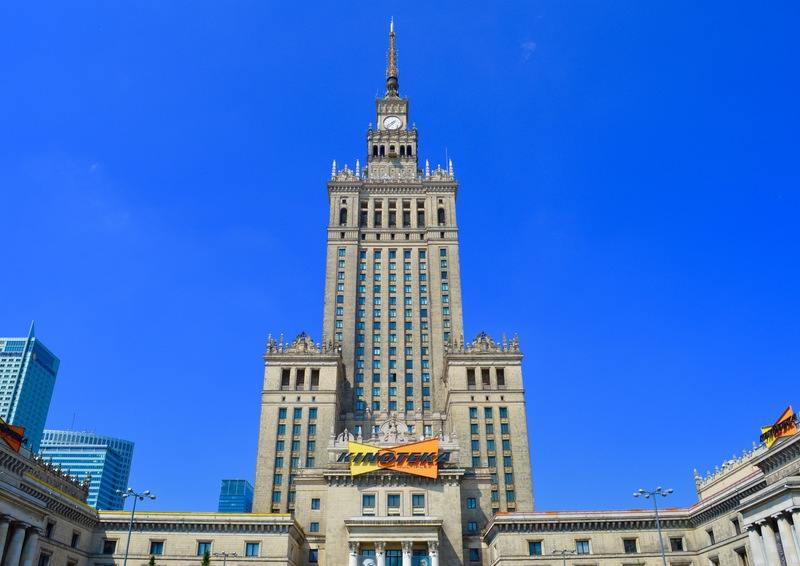 The Palace of Culture and Science is the most famous attraction of Warsaw and the tallest building in Poland with a hight of 231 meters. 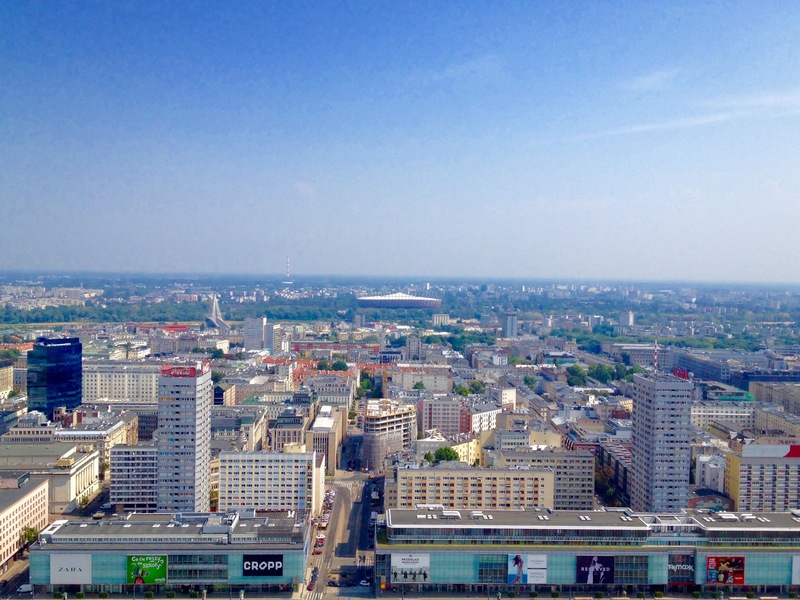 The gift of the Soviet Union was built in the 50’s and offers a viewing platform on the 30th floor – its visit is essential! From 114 meters above and in good weather conditions, the view reaches far beyond the city limits of the 1.8 – million metropolis. The Centrum, which is the area around the Palace of Culture and Science, applies with its modern skyscrapers as a symbol of the modern and capitalist Warsaw. 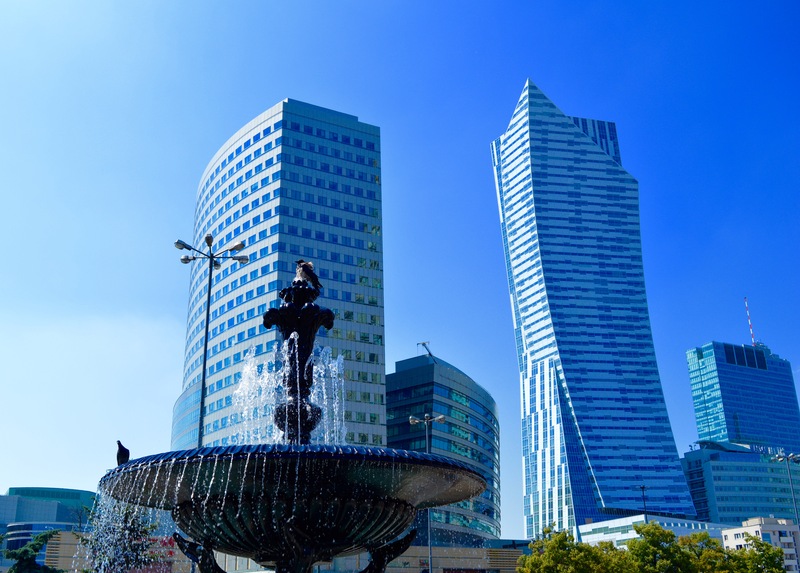 Whether international financial institutions, well-known luxury hotels and ultra-modern office complexes – in the heart of Warsaw everything is reachable in walking distance. 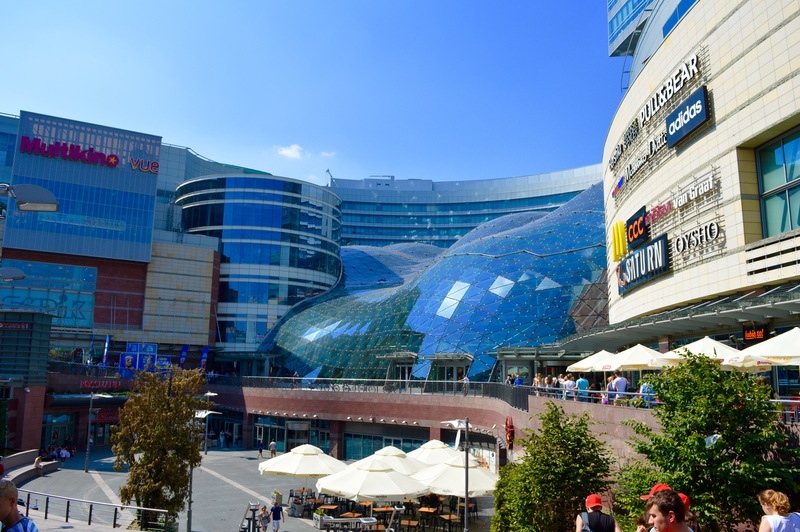 In the „Centrum“ as well, you can find the Zlote Tarasy – an ultramodern shopping center with an extraordinary architecture. The most expensive Polish real estate project of the 21st centure (in 2015) offers many international brands, an entertainment and fitness area , as well as two office buildings. 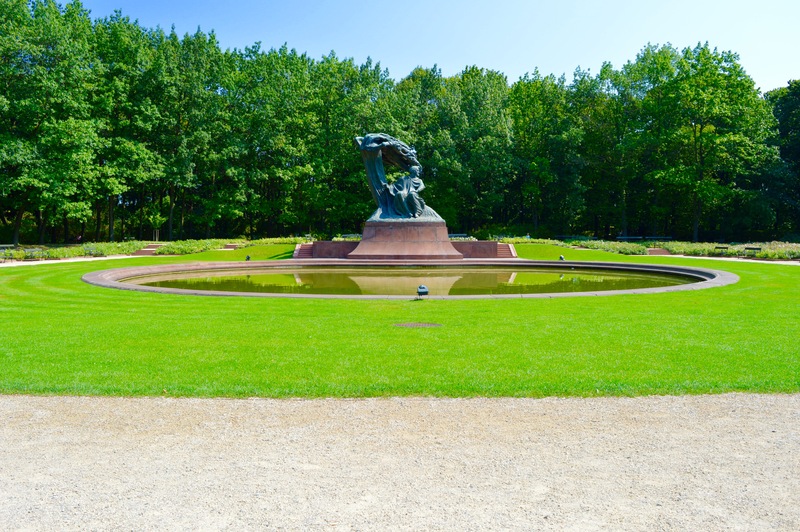 Not far from my hotel, there is the Lazienki Park – the largest park in Warsaw. Here I’ve spent the last hours before my flight back to Munich. And I regret that I haven´t been there earlier..! 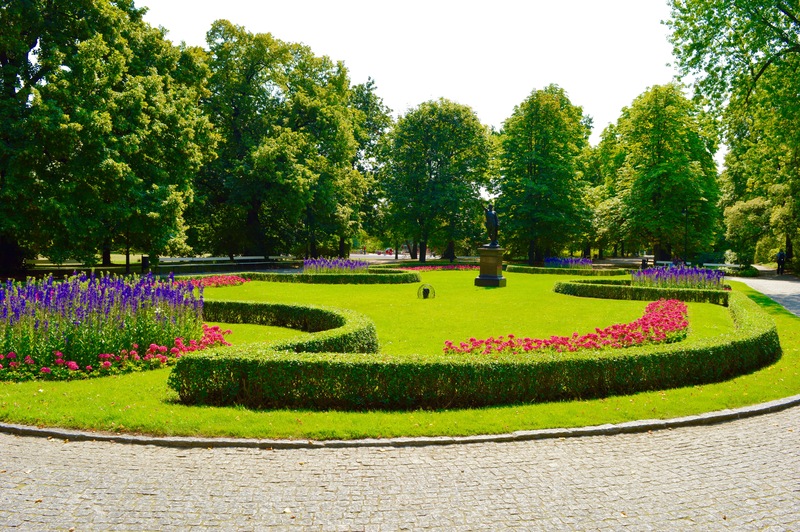 As Warsaw itself, the entire park and all the green areas are very clean, well maintained and the size is really overwhelming. 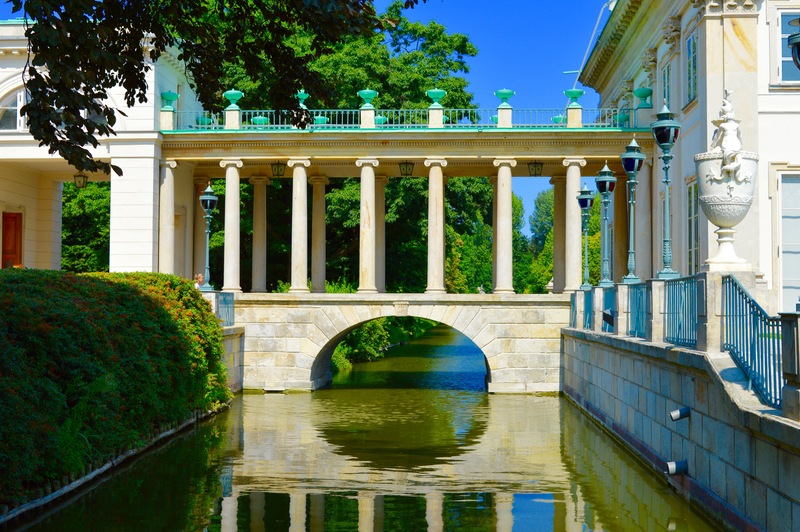 Several monuments, flower beds, rivers and lakes constitute the city´s green lung – definitely worth a visit! 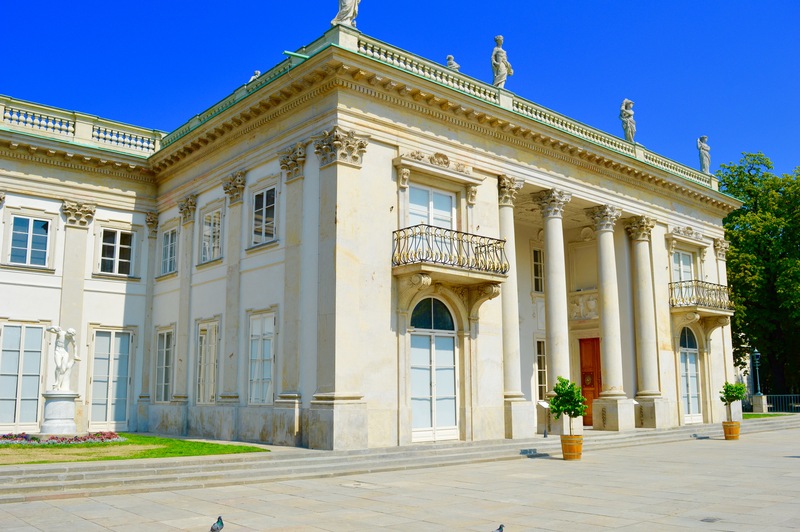 The Lazienki Palace is probable the most beautiful building in the park. It was built in the 17th century, destroyed during the Wold War II and has been beautifully rebuilt. Surrounded by a stunning landscaped lake, you can relax there on a boat or watch the turtles on the shore – amazing! 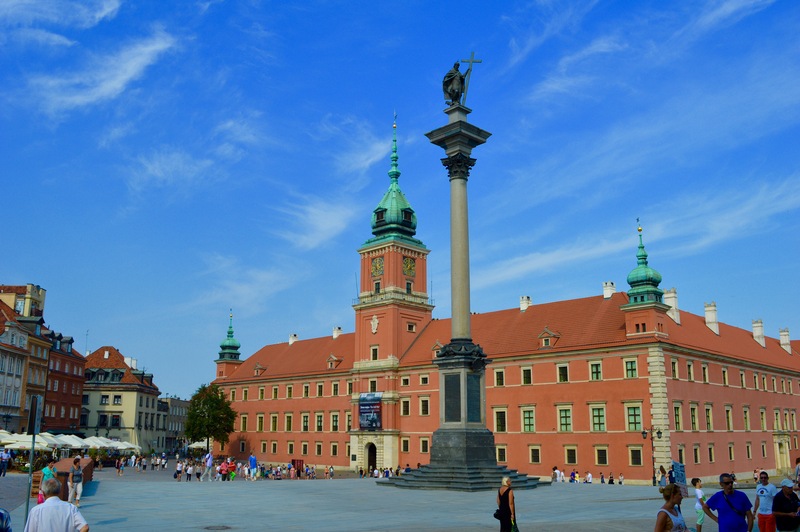 4 days in Warsaw end – 4 days in a fascinating, diverse and exciting city! 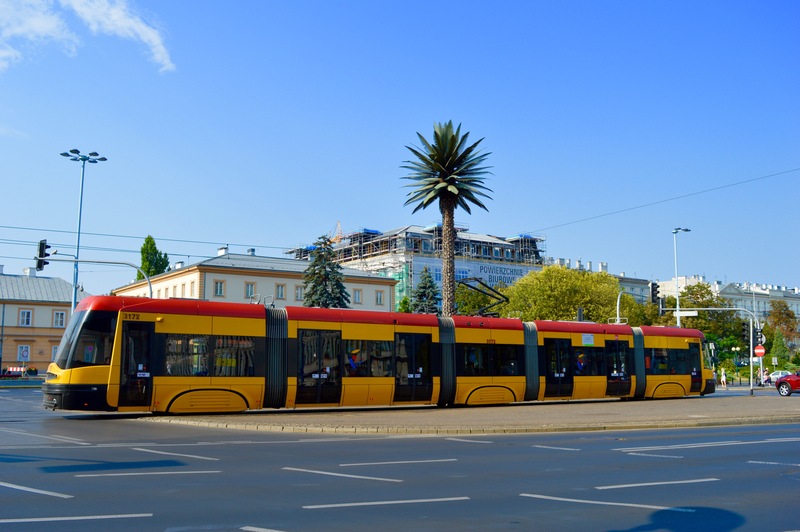 Unfortunately the popularity of the Polish capital is still in the shadow of other European cities – absolutely wrongly! Besides the beauty of Warsaw and the friendly Polish people, the price level is much lower than in in cities like Athens or London. 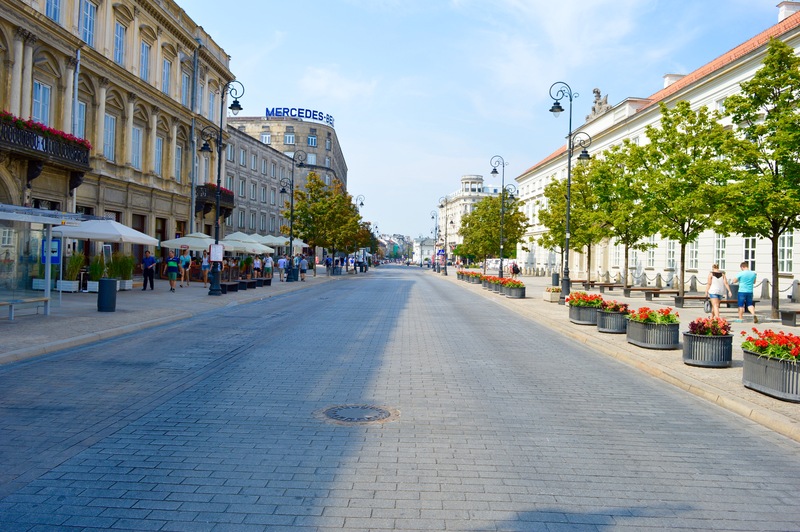 Another aspect of Warsaw´s beautiy is the cleanliness in the whole city! 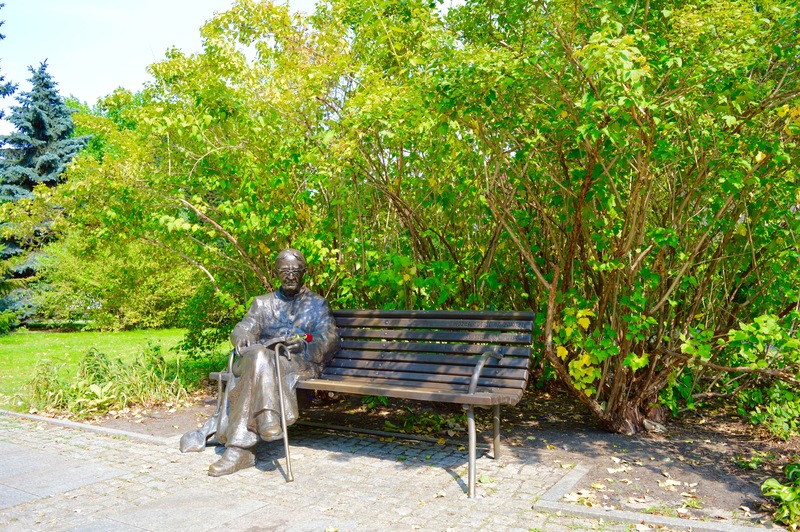 Neither chewing gums on the streets, nor garbage in the parks or the old town – everything is very well-kept. Even in the bars, a staff member was immediately on the spot if someone (…in this case, me) lets an ice cube fall to the ground – I’ve never experienced something like this before! However, the thing I will remember the most is the friendliness and openness the Polish people have given to me. At the beginning of the trip, I had a little doubt about that, not least because of our common history. Fortunately they were already eliminated after the first smalltalk. 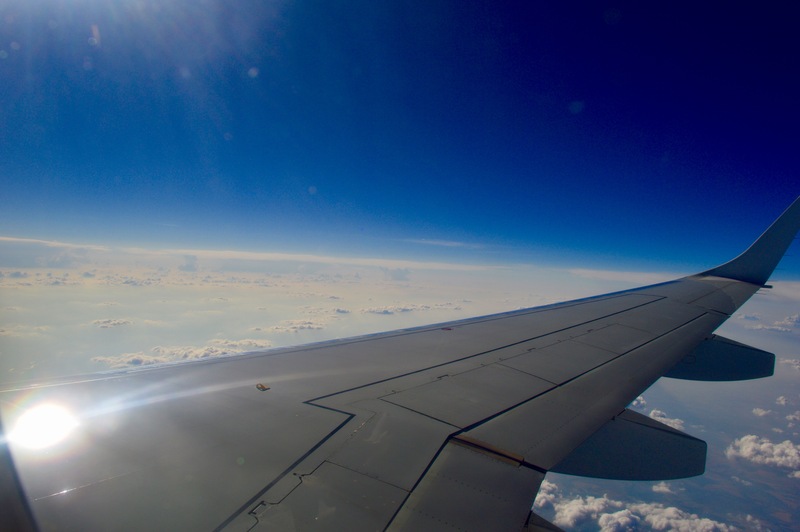 Because of all that, I will definitely return in this wonderful city city – as soon as possible!